Buffer preparation is one of the most resource-intensive activities in biomanufacturing due to the large number and overall volume of buffers and process liquids used in a typical bioprocess workflow. As a result, buffer preparation can be prone to create bottlenecks in the manufacturing process. In this paper, we present different approaches to resolve buffer management challenges in large-scale biomanufacturing. 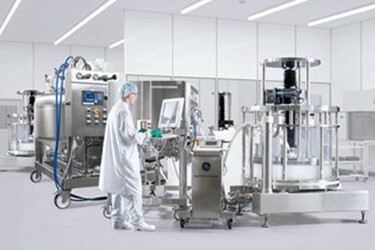 Outsourcing and technologies such as in-line conditioning (IC) and in-line dilution (ILD), and how they can help prevent resource constraints, save time, and reduce manufacturing footprint and overall cost in buffer preparation, will be discussed. As an example, we demonstrate how IC can be used to reduce the total volume of the stock solutions up to 79% and the total footprint of the buffer management system and tanks by 40% over traditional buffer preparation.